Mary Ann Mennerick, 83, of Granite City, Ill., born January 17, 1935, in St. Louis, Mo., passed away at 2:50 p.m. Friday, April 20, 2018, at Edwardsville Nursing and Rehabilitation. Mary graduated from Alton High School, Alton, Ill., in 1953. Mary was a loving wife, mother, and grandmother who cherished taking care of her family. She was a member of St. Elizabeth Catholic Church, Granite City, Ill., and part of the Marriage Encounter Family and Koinonia Fellowship. A very talented homemaker, Mary loved sewing and decorating her home. She always enjoyed a new cookbook and trying new recipes. She loved baking birthday cakes for her grandchildren. She enjoyed reading and gardening and especially loved seeing her dogwood and red tulips bloom. She loved camping in her earlier days and continued her love of trout fishing as long as she could. 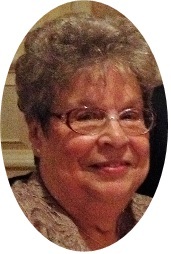 Mary was a former kindergarten teacher, Girl Scout Leader, and preschool Religion teacher. She cherished the precious time she could spend with her family especially her grandchildren and great-grandchildren. She was preceded in death by her parents, William and Margaret, nee Plumpe, O'Brien; her brothers, William O'Brien and James (Shirley) O'Brien; and sisters-in-law and brothers-in-law, Unabelle (Art) Buller, Lavera (Gerald) Davis, and Donald Kunze. Surviving are her husband of 63 years, Reginald Mennerick, whom she married February 12, 1955, at Saints Peter and Paul Catholic Church, Alton, Ill.; three children, Regina (Prem) Hinduja of Pleasanton, Calif., Michael (Cheryl) Mennerick of O'Fallon, Ill., and Rita (Woody) Halbrook of Granite City, Ill.; six grandchildren, Michael (Suzanne) Halbrook, Sara (Michael) Ahlvers, Sean Halbrook, Greg (Ashley Rothe) Mennerick, Jenny Mennerick, and Doug (Sarah) Mennerick; seven great-grandchildren, Thomas, Matthew, Joseph, and Andrew Halbrook, Mira and Evelynn Ahlvers, and Madison Mennerick; brothers, Edward O'Brien of Maryland Heights, Mo., and Paul (Toni) O'Brien of Collinsville, Ill.; sister, Catherine Gibson of Jerseyville, Ill.; brothers-in-law and sisters-in-law, Charles (Linda) Mennerick of Apache Junction, Ariz., John (Mildred O'Berry) Mennerick of De Soto, Texas, Rev. Dr. James (Ruth) Mennerick of St. Charles, Mo., and Dr. Lewis (Mehrangiz) Mennerick of Lawrence, Kan.; cousins; nieces and nephews; friends; and her beloved dog, Buddy. Memorials may be made in the form of masses; to Holy Family School, Granite City, Ill.; or St. Jude's Children Research Hospital. Visitation: Friends may visit from 5 to 8 p.m. Wednesday, April 25, 2018, at Thomas Saksa Funeral Home, Granite City, Ill.
Funeral: Funeral Mass will be held at 10 a.m. Thursday, April 26, 2018, at St. Elizabeth Catholic Church, Granite City, Ill., with Father Zachary Edgar officiating.